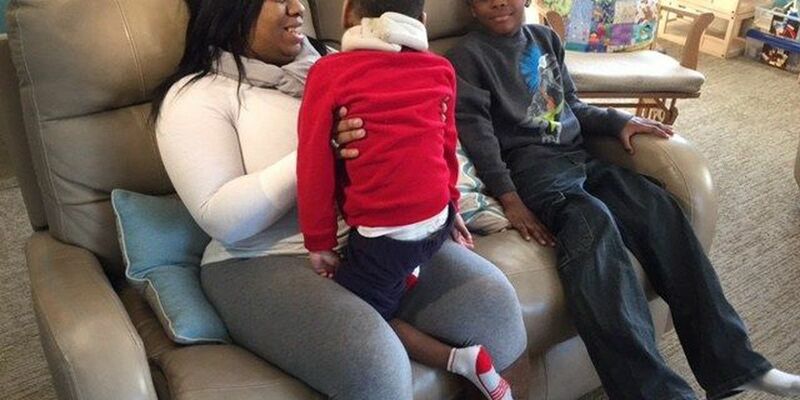 CLEVELAND, OH (WOIO) - Taneika Oliver took her two sons to Providence House, a crisis nursery in Cleveland, after having her Rainbow Terrace Apartment broken into four times. A bullet hole is still visible in the screen of her 3-year-old son's bedroom window. Oliver says she's even been at home when someone has tried to break in through the front door. She uses a mat (usually used for therapy) as a barrier in front of her door to help protect her 3-year-old son with cerebral palsy. "I use it as a protection thing for us. I just place it over the door at night time, and if someone tries to come in it, we can hear if it falls, so it makes a noise. This is pretty much our protection for our front door," described Oliver. Oliver's son, Raven, is just 7. His bike, scooter, video games and TV have all been stolen during the recent break-ins. "It's a lot of break-ins. I don't feel safe around where I am. I just don't like it. Why do they break into our house?" said Raven. Thieves have destroyed 3-year-old Brylan's therapeutic walker, stroller and special seat. Oliver brought both of her kids to the Providence House because she says she can no longer keep them safe in her home. "I'm not safe. I don't feel safe at all. It's not a comfortable place for me and my kids. I had to make the decision to find a safe place for them. The home that we are living in is not safe," Oliver explained. Rainbow Terrace Apartment Management says they have a 24/7 security staff and a state-of-the-art camera monitoring system. They say they are working with Cleveland Police and sharing their surveillance video to try and identify a suspect, or suspects, in the break-ins. They also say they just purchased two new surveillance towers that will add light to the property, along with 20 to 30 new cameras. Oliver says they just put in new lighting behind her apartment, but she still doesn't feel safe enough to bring her boys home. "It's devastating to have to look at your kids knowing these people can come in and take everything that I try to get for them. It hurts to not have the kids in the home with me," Oliver said. A GoFundMe account called "Help me keep my kids safe," has been set up to help Oliver replace what was stolen inside her apartment, including her son's special needs equipment.